👤 This documentation is intended for Discovery Users. 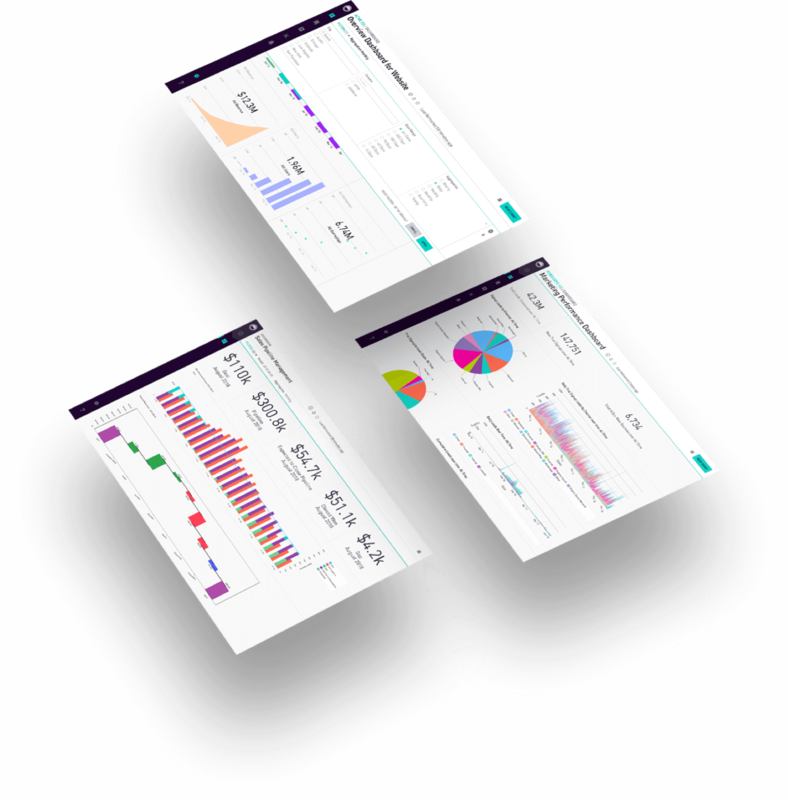 Note: The details below depict our latest Data Discovery update, to be released on April 1st, 2019. 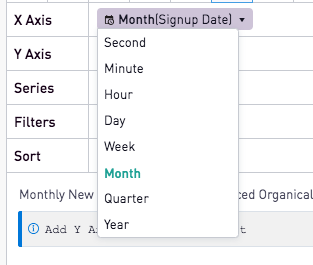 To put the month on the x axis, drag the date field (in this case signup_date) into the X Axis field. 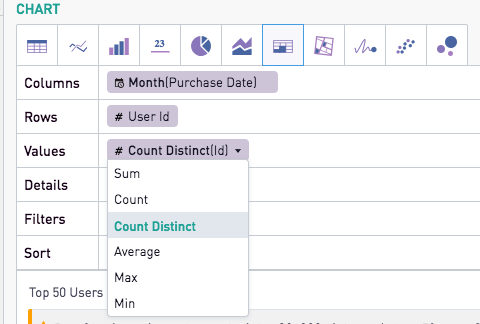 The drop down menu arrow that appears by the name of the field allows different aggregation options. Here, select "Month." 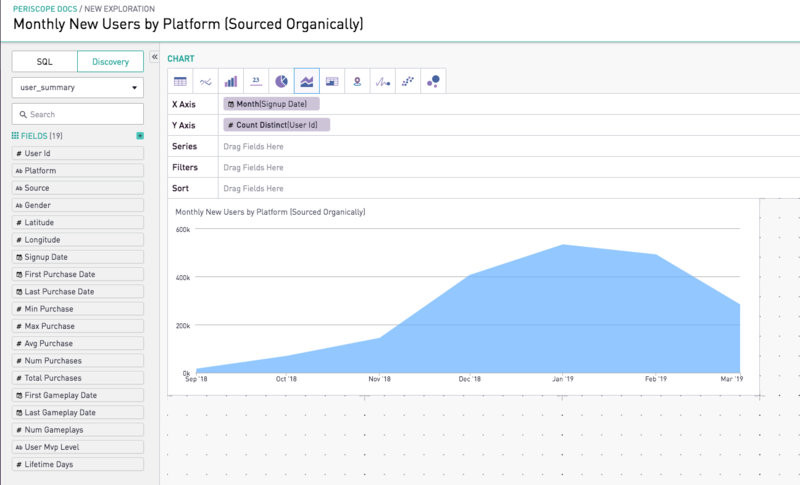 So far, the final chart shows total monthly new users..
To filter the result set on a specific subset of the data, drag the field that determines the filtering criteria into the Filters field. The drop down menu allows users to define their exact criteria. 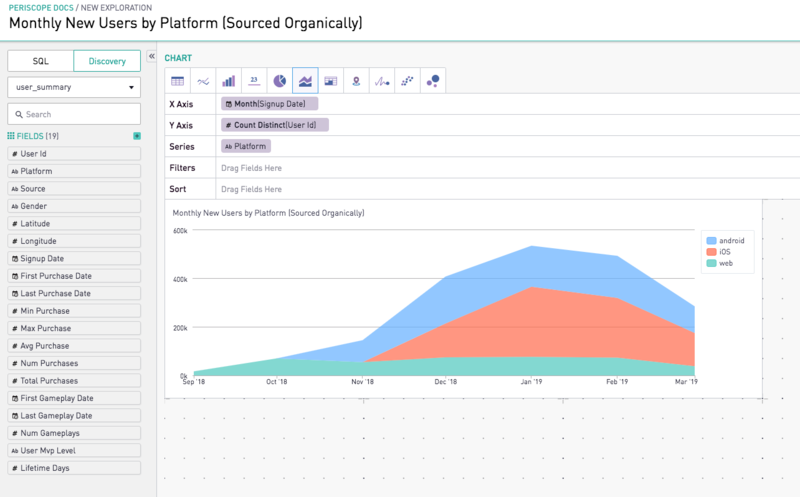 Here, the "Source" field must be set equal to organic and the chart updates accordingly. Select the Cohort grid chart type. 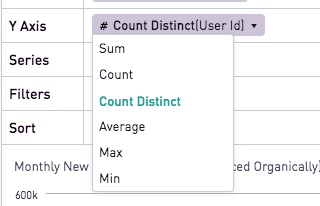 Cohort grids provide similar functionalities as tables with additional parameters, such as Rows, Values, and Details. Since the cohort grid will show the monthly number of purchases, each column should represent one month of data. 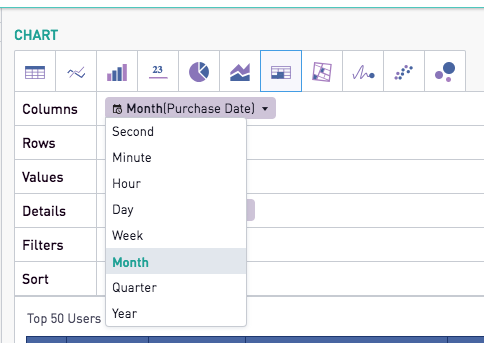 Drag the Purchase Date into the Columns field, and select Month as the date aggregator type. The rows will correspond to the userid for each of the users on the platform. The goal of this cohort grid is to show the number of purchases. Each purchase is identified by a unique ID. Calculating the count of distinct IDs will provide the number of purchases per user. The goal of this analysis is to only provide metrics for the top 50 users. To achieve this, drag the same field used in the "Row" field to the "Sort" field. Here, a drop down box will appear with further options on the sorting criteria. In this case, the sort order must be "Descending" (highest values will be shown at the top of the chart). 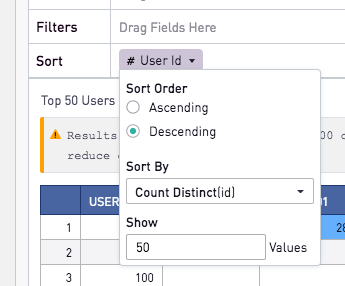 The "Sort By" field is Count Distinct(id), corresponding to the number of unique purchases per user. The value in the "Show" field determines the number of rows the final analysis will display. In this case, the cohort grid will show only the top 50 users. 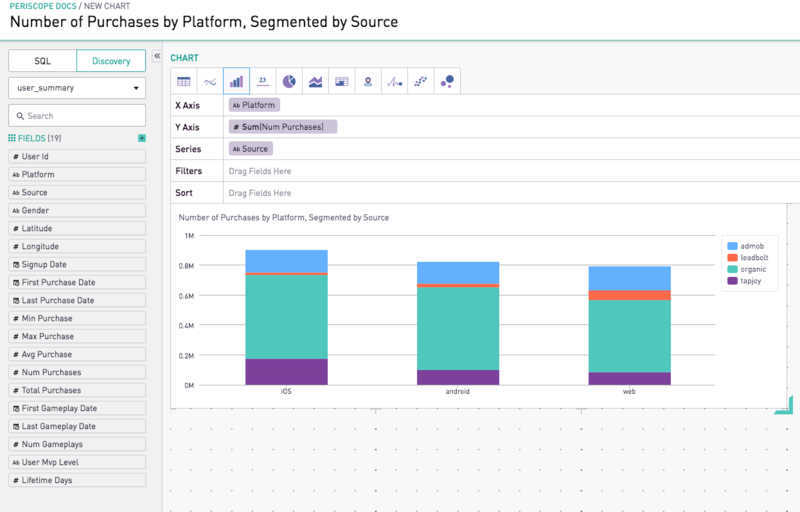 Detail columns provide additional context to the analysis. User IDs, while great for building analyses, are not efficient for reporting. Adding a detail field with the user's email address solves for this. 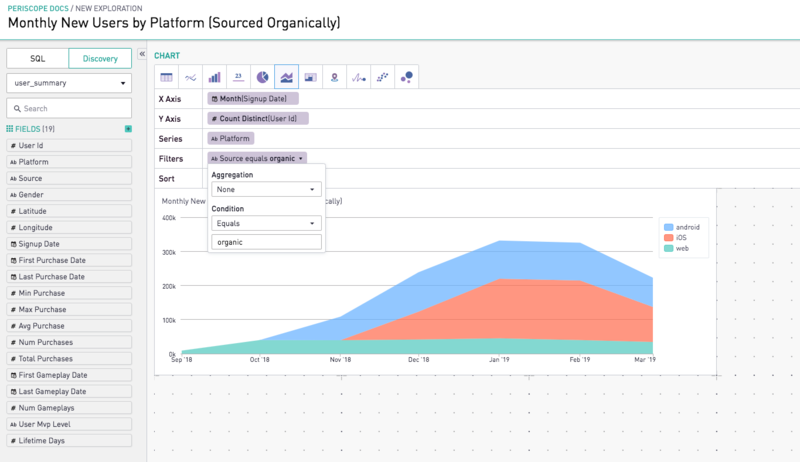 Additionally, the analysis users could be further classified by platform; simply add Platform as a second detail column. 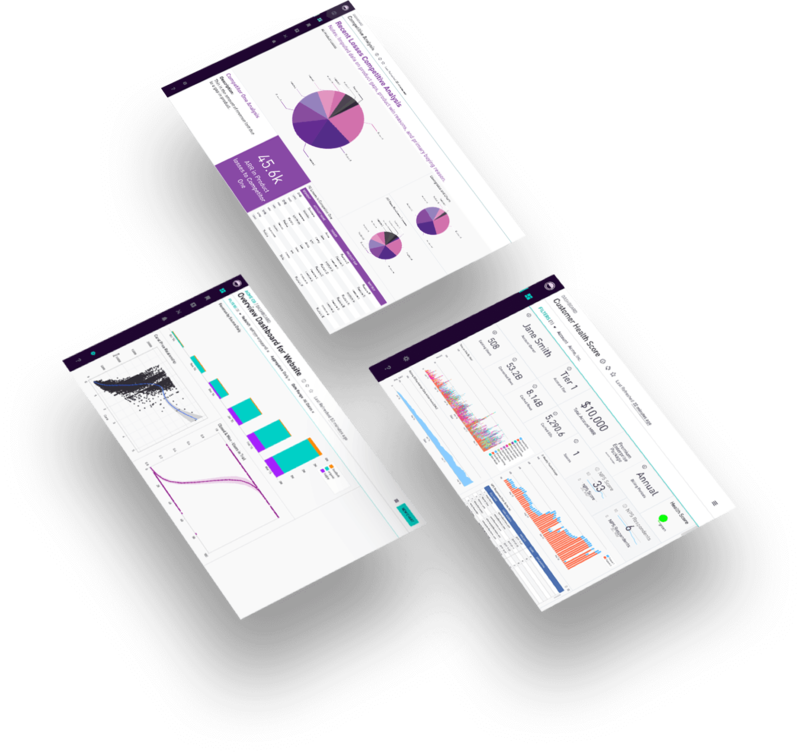 The final result displays the top 50 users on the platform, with additional information on their email addresses and platform.